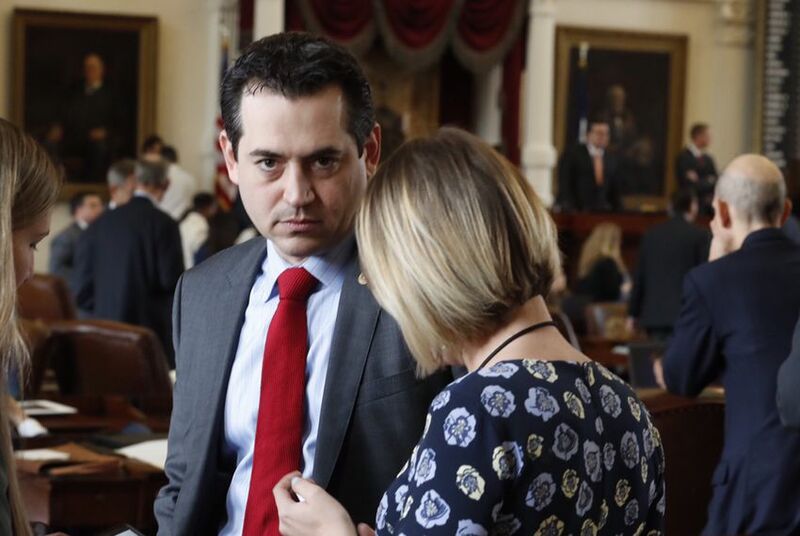 State Rep. Matt Rinaldi, who drew national attention as part of an incident on the Texas House floor in which he said he reported protesters to ICE, represents one of 10 Republican-held House districts that Hillary Clinton won last year. State Rep. Matt Rinaldi's scuffle Monday with Hispanic lawmakers is already putting a bright spotlight on his House district — and on the question of whether he can hold on to it in 2018. Rinaldi, an Irving Republican, almost lost the district last year to Democrat Dorotha Ocker, winning by 1,048 votes out of nearly 59,000 cast. Within hours of Rinaldi being at the center of a confrontation on the Texas House floor that drew national attention, Ocker, a Dallas attorney, announced on Twitter that she will run again for the seat. In a brief interview Tuesday, Ocker said she had decided to challenge Rinaldi again before the incident Monday. Still, "it's sad Rinaldi did what he did," she said. Rinaldi and his Democratic colleagues traded accusations of death threats on the last day of the 85th Legislature's regular session after he said he called federal immigration authorities on people in the gallery protesting the state's new "sanctuary cities" law. Rinaldi said state Rep. Poncho Nevárez, D-Eagle Pass, "threatened my life on the House floor," in a statement Monday. Nevárez said Rinaldi was lying, and state Rep. Justin Rodriguez, D-San Antonio, said Rinaldi had threatened to “put a bullet in one of my colleagues’ heads.” Rinaldi said in his statement that he was speaking in self defense. As they denounced Rinaldi's role in the dustup, Democrats made no secret they were already looking toward 2018. "When someone like that shows their true colors, I would say he’s a broken person, and I hope his community back home realizes that when he’s back up for re-election in 2018," Rodriguez told reporters. Rinaldi's House District 115 was already on Democrats' radar because it was among 10 Republican-held House districts in Texas that Democratic presidential nominee Hillary Clinton won last year. She carried Rinaldi's district by 8 percentage points after GOP presidential nominee Mitt Romney won it by 12 in 2012. A representative for Rinaldi said he was not available for an interview Tuesday, but he has previously spoken about how he deals with the unique dynamics of his district. "I’m not only a Republican, I’ve been consistently identified as probably the most conservative Republican in the House, if not one of the most conservative Republicans in the House, yet my district is 60 percent minority," Rinaldi said last year at a Texas Tribune event. "It’s only 40 percent Anglo, it’s 30 percent Hispanic, 20 percent Asian, 10 percent African-American. Yet I get elected from this district. I serve my constituents well. And it’s because I talk to my constituents about issues. I reach out to groups that traditionally don’t vote — when some of our colleagues won’t."